To beautify our surroundings and breathe a little easier, we usually include several living plants in our home and work spaces. Plants are beautiful and work as air cleaners and make our indoor environments more pleasant for living and working. While plants cleanup the air, remove carbon dioxide and produce oxygen, they may also be subject to harmful affects of some pollutants such as cigarette smoke. 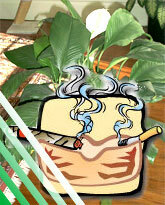 In this project you will perform an experiment to test the effect of cigarette smoke on the growth of plants. To ensure that all plants that you test are identical, you start by planting some seeds and expose seedlings or young plants to smoke.